The fresh herbs really give the salad its pizzazz, so try to find some if you don’t grow your own. If the corn is frozen, put it into a colander and rinse thoroughly with cool water to begin defrosting. Drain well, and place the corn into a 2-quart or larger bowl. Add the other vegetables and the basil and oregano and mix well. In a measuring cup or jar, combine the garlic, water, seasoned rice vinegar, and black pepper. Pour the dressing over the vegetables and stir to coat well. Refrigerate, covered, for 1 hour or up to 2 days. 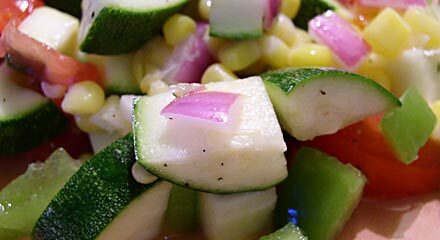 The zucchini will release moisture as the salad marinates. Lift out salad with a slotted spoon to serve. I made this for the first time about 3 weeks ago, and it is really awesome. My friend at work said she does not like corn or zucchini, and she has made it at least 3 times now. I have had to print the recipe 4 times for non-vegan, fast food eating friends! Go veggies – yay! I eyeball all my veggie quantities and double my garlic (I am a garlic addict). So simple yet so fabulous. This is an excellent salad! One of my co-workers said she doesn’t like corn or zucchini, but she ate every bit I was willing to share. She asked for the recipe, too! I love it as well, but I already love all the ingredients :). Sambola, It is my understanding that TVP is almost entirely made up of soy protein isolate–you cannot have TVP without out it. To get a similar textured product, you can freeze and then thaw tofu that is made with whole soy beans–it’s not as convenient but you won’t have to worry about eating a food that can be dangerous to your health. To add flavor you can thaw the tofu by boiling it in a broth. Or if you want a really strong taste, press the tofu, marinated it and then freeze it, and let it thaw naturally in your fridge. Susan, I just can’t tell you how much I enjoy your web-site and all the delicious recipes you share with everyone. I am eating your Chili Mac right now & it’s yummy! I’ll add more chipotle pepper to the next batch, but it’s so good with an avocado. I really appreciate everything you do and all the energy you put into website and blogging. Though I’m not much of a blogger I love reading all the comments and feedback people have. And that one about the okara who like I did had to look twice at that thinking I know she’s not talking about okra. And btw I did figure out what TVP stand for. I knew I had heard of it before, just never bought any of that textured vegetable protein stuff. Do you know of a brand that does NOT have the isolated soy protein in it? Or I should ask it this way…Is there a brand of TVP that Dr. John McDougall approves of? I know I would be safe with his recommendation.